Portico is a charming apartment in an agritourism area. 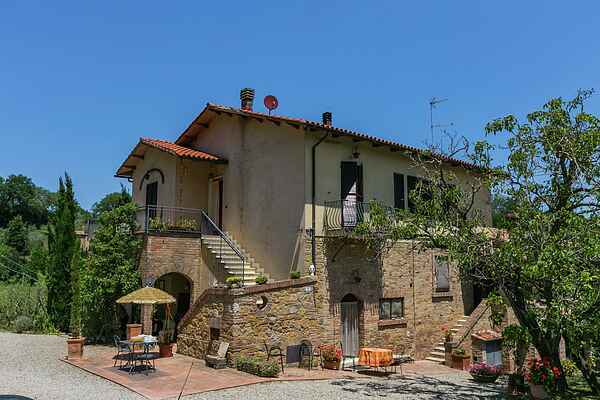 This old stone farmhouse has been completely renovated and there are 4 apartments in total. The agritourism area is surrounded by a typical Tuscan landscape of olive trees and vineyards. The center of Montepulciano is just 500 meters away. The apartment, Portico, is quite stylish and the dining room leads out onto the terrace. There is a saltwater swimming pool with a large terrace, where you can sit out in the sun or relax under the shade of the chestnut trees. The agritourism area produces red wine and extra virgin olive oil, and there are also chickens, geese, and rabbits. The guests are allowed to help pick the grapes and the olives, and may also participate in all the other daily activities. You can hike and bike in the area and there is a tennis court just 200 meters away. The Terme di Montepulciano, located 5 km away, is famous for its warm, natural sulfur pools, mud baths, and massages–perfect for the home and the airways.